On Scene: Grand Opening Giveaway! What better way to celebrate the launch of our new blog than with a giveaway? This isn't just any small giveaway either, we're talking 1-0-0 dollars to use as you please at TheFireStore.com. We appreciate our customers and want you to know it! Here's the twist. For every 300 entries we receive, we'll add on another $100 gift certificate to allow for multiple winners! * How cool is that? Winner(s) will be chosen by Random.Org & will be announced here on the blog on Monday, July 18th. Mandatory Entry: Be a "Follower" of this blog, by clicking 'follow' on the widget to the right and comment in the comments section of THIS POST telling us you are a follower! 1. 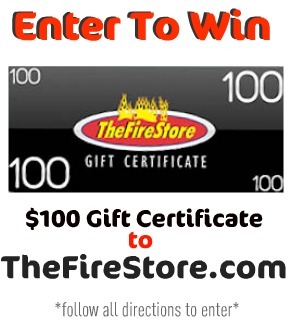 "Like" TheFireStore Facebook Fan Page & mention in a separate comment on THIS POST! 2. Follow us on Twitter (@thefirestore) & mention in a separate comment on THIS POST! Each entry must be submitted in the comments section of this blog post to be counted, and not via Facebook or Twitter. *Disclaimer: This giveaway is not endorsed nor promoted by Facebook. I am following your blog, been a satisfied customer for several years now also! Also 'liked' on FB a while ago, no twitter account so best I can do is 2 of 3. Im following! Have been following you on FB for quite sometime. its a cool idea with this blog !!! ENTER ME FOR FREE SWAG, LOVE YOUR PRODUCTS. Follow you guys on facebook. I follow you guys on twitter. Plus i follow the blog. Show big daddy the money. I liked The Fire Store Facebook page too. This contest sounds interesting. Thanks for the equipment we have bought in past guys! I am following the blog, and looking forward to great things. I'm in! I'm following you guys! I've also been a FB fan for awhile! Also a longtime FB "liker"! ...and now I'm a Twitter follower! Following the blog via e mail! I'm also following on facebook! Following @thefirestore on twitter, too! Following on here and Facebook! I am following the blog, love the website! Liked the page on Facebook a long time ago! I love TheFireStore.com! Its a fantastic website guys, thank you! Liked FB page a while ago. Love your site, waiting for the EMS Store to open! I buy all my fire gear from the fire store. I am following on the blog and facebook. I am fallowing The Fire Store on Twitter! I am also fallowing/like The Fire Store on Face Book! I am following this blog and look forward to the future post. Been a FB follower now being a blog follower ! ! ! I am following this blog. You generally have reasonable prices on your products. Thanks. Following on facebook already, sent a tweet. not sure it worked right and now joined the blog to post. Not really vary good at this blogging stuff. Hope I meet requirements for all 3 entries. I am following this blog! You guys make awesome christmas gift for my fiance who is a career fireman. Plus he orders a lot from you guys because he like the quality of your items and the prices! Thanks for everything! I am following this blog. The Fire Store is the best, and one of my favorite websites. Yay! I'd love to enter! I'm following and I'd love to win!! Following you from Bethlehem PA! Very glad you started this blog! P.s. I am entering! I could use some new tools for my gear! Entering the contest...I hope I win! thefirestore.com is the only people I buy anything fire related from....great products and the are shipped quickly and without hassle. i will never use another store ever again! they have all you need. Following on FB, Twitter and following the blog! Following! Looking to make a purchase soon! I'm following, and theFireStore.com is awesome! I'm following on Facebook too! I love the fire store and a follower on twitter and facebook! Keep up the good work! I liked yall on FB a long time ago. But here is another post. Lastly I started a Twitter account just for this. I've held off quite a while on that. It seems to have missed my first entry so here it is again. Following on Facebook and the blog. i am a follower and really enjoy your web page and your store. i have gotten somethings from there and have really enjoyed it thanks to all the firefighters. Still Following your Facebook, Again Keep up the good work! Glad to see this happening. Just letting you know I'm following the new blog. Also been a Facebook fan for quite some time now. Already a FB fan, now I'm a blog follower too. If this keeps up I'll have to create a twitter account also. Starting to dig technology. Liked you on Facebook as well. I have been a satisfied customer for several years now also! So I gust wanted to say keep up the good work and I look forward to purching more stuf from you in the futcher. It was great to see you guys at the Maryland Convention in OC last month! I am following the blog. I already Like The Fire Store on Facebook. Fan of The Fire Store on Facebook too. usually a leader... this time definitely a follower! Liked you on facebook as well!! I am a follower and shopper. Great service and selection. Also Like the Facebook page. I am a follower ..
$100 will not even come close to scratching the surface of my thefirestore.com shopping list! i am following ur blog!!!! Also "liked" on Facebook... Thanks again! And I already follow on Facebook! Entered! Can't wait to see what's next in the blog.